If you are new to the online slot games, we strongly suggest you take a tour through our Beginner’s Guide to Slots, as there you can find all the information about slots, the slot terms, and links to guides like this one. 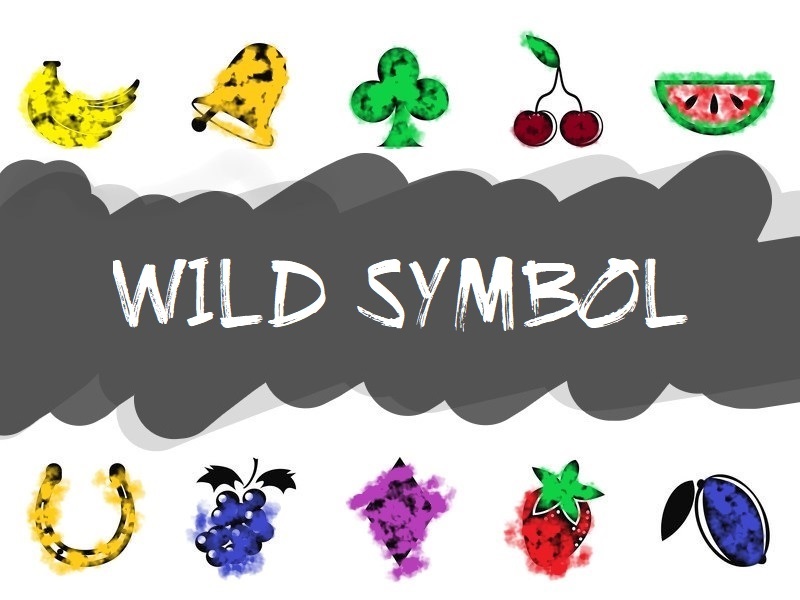 In this article, we will be talking about the Wild Symbol and what it does to the Online Slot Machines once it lands on the reels. The Wild Symbol appears frequently in the online slot games, and it’s the very first special symbol that made it to the reels on one Online Slot Machine. The Wild Symbol appears in all sorts of gambling as the card or symbol that can substitute all of the normal symbols in the given game, or in this example the slots. It can be found on the reels, just like a normal symbol landing on the reels and getting on the paylines to participate in the winning combinations. The basic job for the Wild Symbol is to substitute the normal, higher and lower valued symbols of a slot game and help them with the winning combinations. For example, if there are two symbols of the same type on an active payline separated by a third different symbol, there won’t be any winning combination. But if we manage to land a Wild symbol in the middle in between, there will be a winning combination. The Wild symbol, in some specific games, also pays out when three or more of it land on an active payline, and it’s usually not the greatest payout from the game, but something is always better than nothing. Without any exception, 99% of the online slot games possess a Wilf Symbol in their arsenal of symbols. It can find its place among the three reeled slots, the five reeled slots, the 3d Slots and despite the gender of the game, the theme it revolves around or the Slot Manufacturers. The best way to see whether a slot game possesses a Wild symbol is to click on the Paylines or More Info once you enter the online slot machine, and find it there, or if you check our review of the game, we have the wild symbol covered. How Does the Wild Symbol Look? As we just mentioned, the best way is to enter the game itself and click on the Paylines or More Info about the online slot machine, and you can see the wild symbol there. Almost all of the games have a wild symbol that has the word WILD written at the bottom of the symbol, but if not, they clearly state which one of the symbols present in the game is a wild one, as it’s a special symbol. If you are interested in a certain game that we have reviewed, you can search in the search box and check our review for the game. We have the wild symbol covered in detail and if you mouse over it you will see how it looks like. See Immortal Romance and Gonzo’s Quest to see what we are talking about. There are several different types of wild symbols in addition to the standard symbol that we were just talking about, so let’s get straight to the point and explain what they are and what they do. The Expanding wilds are one of the most present ones, the runner-ups after the standard wild symbol, and they work in a way that they land one symbol on one position on the reels and tend to change the whole reel into wild symbols. Once the whole reel is wild, you can barely miss a winning combination with your spins. This happens mostly after a nice winning combination you land on the screen, and you can see the expanding wilds as they are characterized by fun and interesting animations once they occur. Stacked Wilds is something similar to Expanding Wilds, as they will make the whole reel with wild symbols so that you can win some great prizes. The only difference is that this type of wild immediately makes the whole reel a wild one, instead of moving one position after another, like the Expanding Wilds. There are some games where the Wild Symbol is a multiplier, like in Thunderstruck 2, the wild symbol is an x2 multiplier. The way these symbols work is they only multiply the win if the wild symbol participates in the winning combination. Some other games feature a wild multiplier of x3, x5, x10 or even x25, so make sure you check them out if you are interested. Just like the Colossal Symbols, the Colossal wilds are practically the same. They are symbols that cover a section of the reels and take up a place instead of 4 symbols (2×2) or 9 symbols (3×3). There are several examples of games where there are colossal wilds, and such an example is Spinata Grande. The so-called Walking Wilds are one of the rarest wilds that will appear on the reels of a slot game. These wilds work in a way that with every consecutive spin, they will “walk” one position left or right, depending on the game or where they landed. Such an example are usually the Net Entertainment slots like Jack and the Beanstalk. Having a wild symbol in a game usually does a lot of justice for you, facilitates your way to the most lucrative wins, and most definitely enhances the game experience and lightens up your mood. By any means, avoid games that don’t have a Wild Symbol, as your job is a lot harder from the start. If we’ve missed something, we are more than happy to hear from you. Use the comment section below or send us an e-mail! Best of luck with the slot games in the future!